WEInstitute's activities and services primarily concentrate on providing career-enhancing professional trainings, developing and managing international capacity-building projects, and fostering worldwide collaborative institutional partnerships. All our international projects, academic partnerships, and educational programs are closely interconnected with one another. Moreover, they are specifically designed to help us fulfill our mission - to connect students, academics and international development professionals with one another and with world-changing international organizations for the development of globally responsible leaders and sustainable communities. Development: Promotion of international development through professional and organizational entrepreneurship and by providing human rights based sustainable development projects. Programs: Provide competent subject matter expertise for institutional-capacity building through the involvement of academia and civil society organizations for the promotion of human rights, justice, peace and dignity. Trainings: Provide professional, skill-based and experiential learning models for the development of internationally engaged and inter-culturally competent global leaders. Connections: Provide connections between experts and cross-sector international and inter-regional partnerships between civil society organizations and academic institutions. The mission of the World Engagement Institute (WEInstitute) is to connect international development professionals with universities, academics and international organizations with the goal of developing globally responsible leaders and sustainable communities. WEInstitute envisions a world engaged through committed global leaders, sustainable organizations for development and interconnected and capable institutions. WEInstitute envisions Chicago and the Midwest becoming a vital context for international development career, education and connections with experts, experiences and key players in the international field of human rights and sustainable capacity building. WEInstitute aims at providing pragmatic, professional and collaborative opportunities for career development in the field of international development through trainings, collaborative connections and capacity building projects. We believe in the power of globally engaged citizens and competent - socially responsible - leaders to make the world a better place. We believe in the power of interdisciplinary collaboration and sustainable partnership to enhance global citizenship and local leadership. We believe in the power of pragmatic - academically informed - institutional capacity-development to foster collaboration and partnership. The WEInstitute motto "we the peoples for a better world" synthesizes the collaborative, participatory and community development approach of the Institute. In partnership with local and regional agencies and through multi-sector collaborations with governments, academic institutions , and United Nations programs and initiatives, the WEInstitute is on the forefront of developing human rights based and capable sustainable communities worldwide. 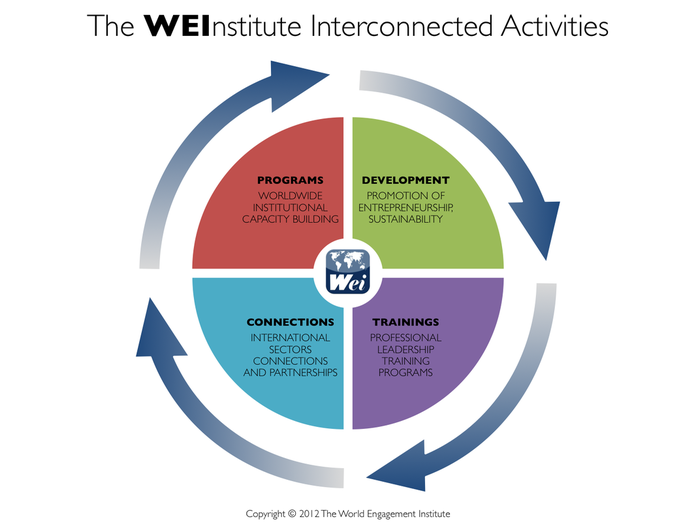 The logo of the World Engagement Institute (abbreviated as WEI) symbolizes its global and international mission with the world map. The shadow and curved lines symbolize the flexibility, inclusivity and collaborative character of its international and intersectoral mission. The pronoun "WE" recalls the values inspired by the Charter of the United Nations ("we the peoples") and the Constitution of the United States ("we the people").